To the public eye people may know me because of football, but did you know that Caitlin received a full scholarship to play D1 soccer at Iowa State University? Sports has always been a big part of our lives so it’s in our DNA to help other athletes reach their full potential. To accomplish this, Caitlin and I became co-owners of ETS Performance in the south and east metro areas. 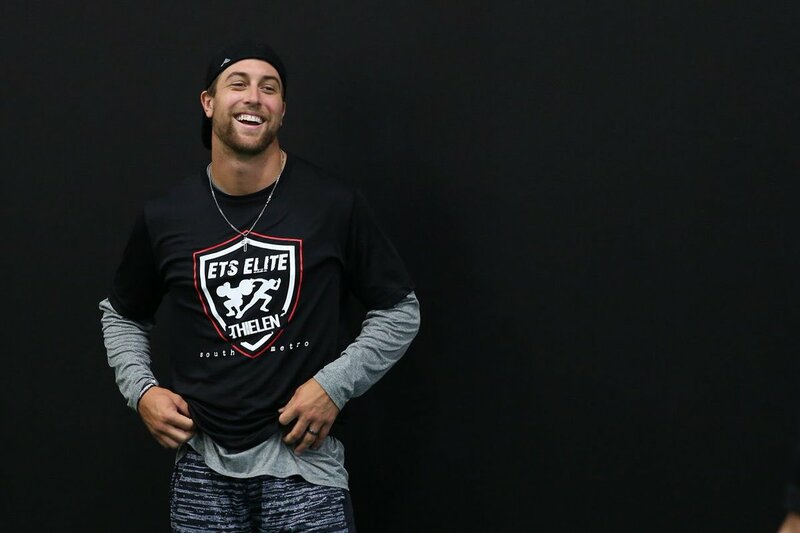 At its core, ETS offers youth, high school, collegiate and professional athletes with unique systems of training to help maximize performance. During my senior year of college I synced up with ETS founder and friend, Ryan Englebert, and decided to give the NFL a shot. Turning my dream into a reality meant I needed my strength, speed, power and mobility training to be next-level in order to eliminate any deficiencies while simultaneously increasing my ability to perform at the highest level. Partnering with Ryan and training with other ETS athletes keeps me focused, accountable and on track to achieve my goals. With discipline as the foundation and excellence as the standard, each workout demands commitment to your goals, determination to overcome adversity and an expectedness to win. Greatness doesn’t come overnight, but if you’re serious about training and reaching your full potential, check out the programs ETS offers by visiting our website. For a more behind-the-scenes look, check out my Instagram page for when I post training updates.